Russell Sage died with a tainted reputation. The aggressive businessman—he was a banker, a politician and railroad mogul—had spent a great deal of time in the courtroom. He was convicted of usuary in 1869 and consistently battled in the courts for property and stocks. Along with his sometimes-partner Jay Gould, his business tactics were often considered ruthless. After Sage’s wife died in 1867 of stomach cancer, his liaisons with women became public and scandalous. According to biographer Paul Sarnoff, his subsequent marriage to Margaret Olivia Slocum was merely an attempt to regain an appearance of decorum. The partnership was cold and loveless and, possibly, unconsummated. By the time Sage died on July 22, 1906 he had amassed an astonishing fortune, not a penny of which went to charity as was expected of millionaires at the time. Instead his nearly $70 million estate went to Olivia. And she would finally have her say. 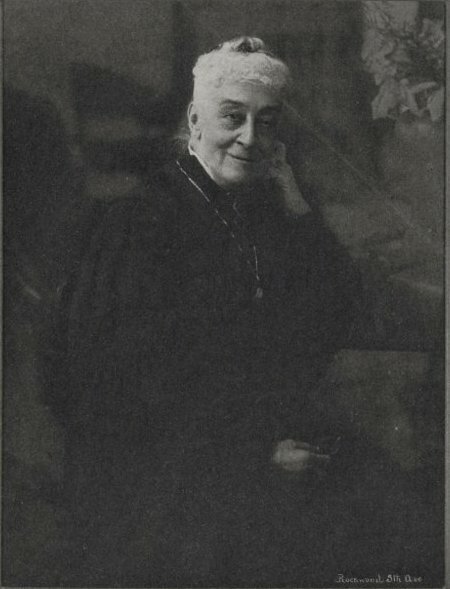 Margaret Olivia Slocum Sage had definite opinions and causes. It was a time of social enlightenment and reform—when privileged citizens were realizing that helping the needy to improve their conditions was far more productive than doling charity. Olivia Sage felt that it was the duty of the “leisured women” to do their part in uplifting the poor and oppressed. The year following Sage’s death, she founded the Russell Sage Foundation with an initial endowment of $10 million. Her intention was to foster the improvement of working and living conditions of the poor. For a few years the Foundation worked out of scattered rented rooms. Olivia’s most trusted adviser, Robert de Forest, argued repeatedly against erecting a headquarters building of its own. But finally in 1912 Olivia Sage got her way. She was adamant that the Foundation have a monumental building that would serve as exactly that—a monument to her husband. In February 1912 the land at the southwest corner of Lexington Avenue and East 22nd Street was purchased for $200,000. The choice of architect was simple. Grosvenor Atterbury had been working with the Russell Sage Foundation since 1909 designing and building a model housing community called Forest Hills Gardens. The ground-breaking development was a precursor to the Modern Movement and influenced European experimental housing projects. Atterbury designed a nine-story Italian Renaissance palazzo in rough-cut Kingwood stone (a red sandstone used only once previously in New York City). Above, an ambitious cornice displayed copper owl’s heads, cherubs and rosettes. One floor and a portion of another were reserved for the use of other philanthropic societies. High above the street on at the ninth floor, six panels of carved granite by sculptors Elisco V. Ricci and John Donnolly expressed the goals of the organization. At this level Atterbury installed the library—far above the noise of the street below. Two stories high, it was floored in red Welsh tiles below stone columns of the same material as the façade with capitals symbolic of the purposes of the Foundation. The library interiors were executed by Tiffany Studios in gray-blue with blue and gold accents. The doors were covered in leather. The collection of books and other resources here was extensive. The libraries of the New York Charity Organization Society, the Association for Improving the Condition of the Poor, the New York School of Philanthropy and the Foundation’s own collection amounted to about 10,000 bound volumes and 15,000 pamphlets. By 1917 there were 17,000 bound volumes which would grow before long to 50,000 along with 200,000 unbound volumes—the largest in the United States devoted exclusively to social problems. The Russell Sage Foundation attacked a broad swath of social issues: the education of social workers, campaigns against loan sharks, industrial conditions including a Committee on Women’s Work, health conditions of children and workers, workplace safety and conditions including accidents, hours and wages. Children’s issues were a main concern the departments tackled hygiene, education, recreation and child labor. Olivia Sage’s insistence that the “leisured women” make themselves responsible was reflected in the organization. In 1905 she had written that educated women were obligated to fulfill the moral leadership roles abandoned by men. For a full decade the Russell Sage Foundation was run by Olivia as president with four female trustees, whom she hand-picked herself. The department heads were mostly women as were many of the research investigators. In describing the new building several publications noted restrooms for women. None for men were ever mentioned. The foundation did extensive surveys then issued the results and recommendations. Publications flowed from the Russell Sage Foundation: “Preventive Treatment of Neglected Children,” “The Delinquent child and the Home,” “Saleswomen in Mercantile Stores,” “Working Girls in Evening Schools,””Housing Reform,” “Social Work in Hospitals, “One Thousand Homeless Men,” and “Laggards in Our Schools,” to name but a few. Above the main entrance, a complex and beautiful carved triptych represented the Russell Sage Foundation’s goal to better social and living conditions of the common man. But he was not done yet. Seven years after the additions, Grosvenor Atterbury was called upon yet again. He designed a 15-story annex behind the main building. The architecturally-harmonious new structure was connected by a “hyphen” at the fourth floor. Here the New York School of Social Work would be housed. In 1949 the Russell Sage Foundation moved on, selling the property to the Roman Catholic Archdiocese of New York. Here the archdiocese operated its Catholic Charities. Then, in 1974, it was purchased by a developer who renovated the structure to 166 rental apartments. The Tiffany-designed library was gutted, the great lecture hall, capable of seating 200 persons, became retail stores, and offices and lectures spaces were obliterated to become uninspired living quarters. Change came again in 1985 when Michael Beloff bought the structure and initiated a second conversion—this time to co-operative apartments. While Beloff’s intentions were more sympathetic with the historic building, most of the interiors had already been forever lost. Fortunately, when removing the modern dropped ceiling in the lobby area, the original stone-vaulted ceiling was uncovered, still intact. From the outside, the imposing building at the corner of Lexington Avenue and 22nd Street, intended to be at the same time a monument to a robber baron and a place of hope for the downtrodden, is essentially unchanged.